Traditionally used for general health maintenance Dosage Adults: One capsule daily with food or as recommended by your pharmacist. Suitable for vegetarians. Contra-Indications/ Caution Not recommended during pregnancy. 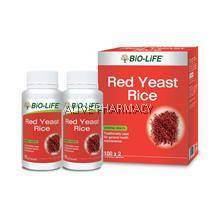 Those with past history of liver disease and those consuming alcohol should exercise caution in the use of red yeast rice. If you are taking any medication for cholesterol control, please seek medical advise before using.